I'm so excited about this weeks giveaway! My good friend Jess recently opened up her etsy shop and she's giving away this lovely antler necklace to one lucky winner! "It all began the moment I graduated. In December of 2011, I graduated university with a Bachelor's degree and thus begun the job hunt. Job hunting turned out to be harder than I remembered so I played housewife while job searching. To fill the time (I can only clean our 650 square foot basement suite so many times), I would make things - anything! Our humble abode was quickly filled with DIY decor and my jewelry tree quickly filled with pieces I made. I absolutely love creating with my hands. It excites me to have a vision in my head, hunt down the perfect supplies, and create something out of nothing. Every time I finished a little project, my husband would encourage me to start a shop and sell my creations. I was scared - what if I'm the only person in the world who likes what I make! With his love and support, I took a leap of faith and opened up shop. The response has been rewarding and exciting. I promised myself that I would only ever make things that I can stand behind - that I love and would wear myself. Trends and seasons influence me but my shop reflects my style - fun, colourful, simple, and a little whimsical. I promise that heaps of love is poured into every piece, sprouting the name HELLO LOVE." 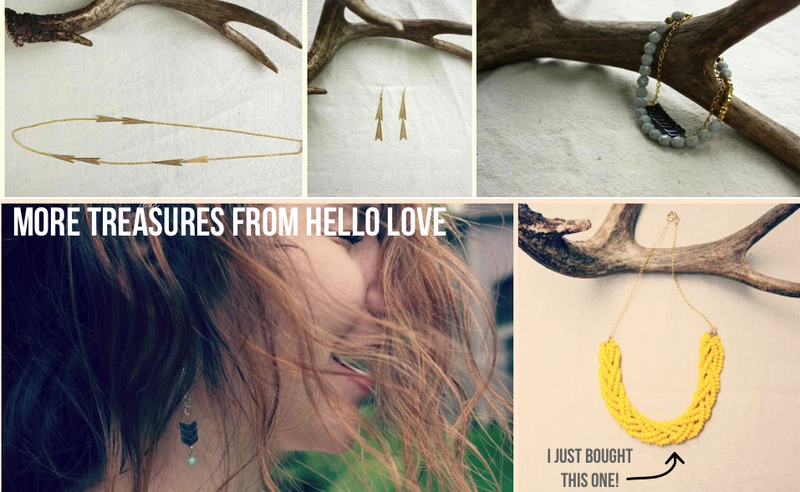 1st Entry: Like kalos and hello love on Facebook and leave a comment here letting us know. 2nd Entry:Share this post tagging hello love and Kalos and leave 2nd a comment here letting us know. ** Don't forget to leave your email address in case you win! !